BackYou are here: Analysis Opinion Encounter deaths or cold blooded murders? Encounter deaths or cold blooded murders? The Supreme court of India ordered a CBI enquiry into the death of CPI( Maoist) leader Azad (Cherakuri Rajkumar), following allegations by his party and several civil rights organizations that Azad was murdered in a fake encounter by the Andhra Police. Even Ms Mamata Banerjee, the new Chief Minister of West Bengal, raised her voice in protest and demanded a proper enquiry, while addressing a public meeting in Jangalmahal before the Assembly election. In West Bengal, except Chatrodhar Mahato, almost all the important leaders of the Adivasi Uprising of Jangalmahal (or the Lalgarh movement as it is popularly called) have faced the same fate as that of Azad. According to the previous Left Front government's statements, all of them died during "encounters" in the jungles. The legendary leaders like Lalmohan Tudu, Sidhu Soren, Umakanta Mahato, Shoshodhar Mahato and many more died in "encounters" with the joint forces in West Medinipur's Lalgarh region. People's Committee Against Police Atrocities (PCPA), in a written statement, complained that Lalmohan Tudu, their President, while returning from home after meeting his daughter (who was due to appear in the Madhyamik exams) was killed by the joint forces from point blank range. Sidhu Soren was killed along with four more militia activists while sleeping in the jungles at Metala. 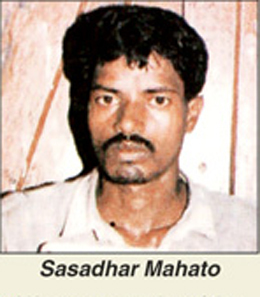 Umakanta Mahato was captured by the CPI(M) activists and handed over to the joint forces who eventually killed him. Seven young CPI(Maoist) squad members were killed at night in the jungles at Ranjja while they were asleep - their bodies were carried hanging in bamboos which created huge resentment. The last "encounter death" in Lalgarh, just before the election process began, was that of Shoshodhar Mahato's. He was the younger brother of Chatradhar Mahato - jailed PCPA spokesperson. After identifing the body of Shoshodhar Mahato, Chatrodhar issued a statement and claimed that his brother was killed in a fake encounter. He claimed that he was killed by the joint forces after being captured from a hideout. An Association for Protection of Democratice Rights (APDR) fact finding also claimed that bullet injuries and position of his body and arms etc proved that there was no encounter at all and he was killed in a fake encounter. Police authorities and Government of West Bengal as usual claimed that he was killed in an encounter and they refused to order any enquiry. Actually, the Left Front Government of West Bengal never ordered any enquiry for any of the "encounter" deaths. PCPA has published a list of martyrs of the Lalgarh movement and there were 94 names on that list, counted till August 2010. Out of these 94 persons, 45 persons were shown as murdered in fake encounters by joint forces or Bengal police. Not a single encounter has been investigated by the Government of West Bengal, nor any enquiry has been ordered. Umakant Mahato, PCPA Leader was captured by the CPI(M) activists and handed over to the joint forces, later killed on 27th August 2010. National Human Rights Commission has ordered that every 'encounter death' should be reported to them within 48 hrs and every 'encounter death' should be investigated by an independent organisation. Our IPC, CrPC and Article 21 of Indian constitution also demand full and impartial investigation in case of each and every 'encounter death'. Yet none of that has happened in West Bengal. The most heinous crime is that in most of these cases, the families were deprived of the bodies of their dear ones. The Government claimed that the families did not demand the bodies. But APDR investigation revealed that they were strongly threatened of facing the same fate if they were to go for collecting the bodies. Even the post mortem reports were not provided to most of the families of the victims. West Bengal has a new government now. But the new Chief Minister ,Ms Mamata Banerjee, is still maintaining a calculated silence over the issue. Not a single Police personnel has been punished for torturing people during the previous regime. But the people of Jangalmahal and rights activists across the state expect and demand that the new government announce a thorough investigation into all the cases of encounter deaths in West Bengal and give exemplary punishments to the culprits and due compensation to the families of the victims.